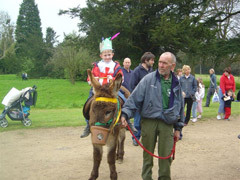 Children of all ages enjoy the fun of donkey rides with Dunton Stables donkey ride hire. Dunton Stables donkeys are all well behaved and lovable, and are guaranteed to bring back childhood memories of seaside holidays, whether you enjoy donkey rides at Dunton Stables or from hiring our donkeys for your own event. 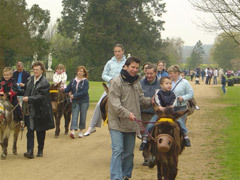 Our "Fluffy Faces Donkey Rides" are famous all over the country, they are a popular attraction at many major leisure events in the United Kingdom. Donkey rides are always in demand for fetes, carnivals and birthday parties, but today they are far less common than they used to be. Dunton Stables run an on-going breeding programme to ensure donkey rides will always be available, giving endless hours of pleasure to generations of children to come. Dunton Stables carries full insurance for the provision of donkey rides and all activities are risk assessed to help to ensure the safety of the public and of the animals.